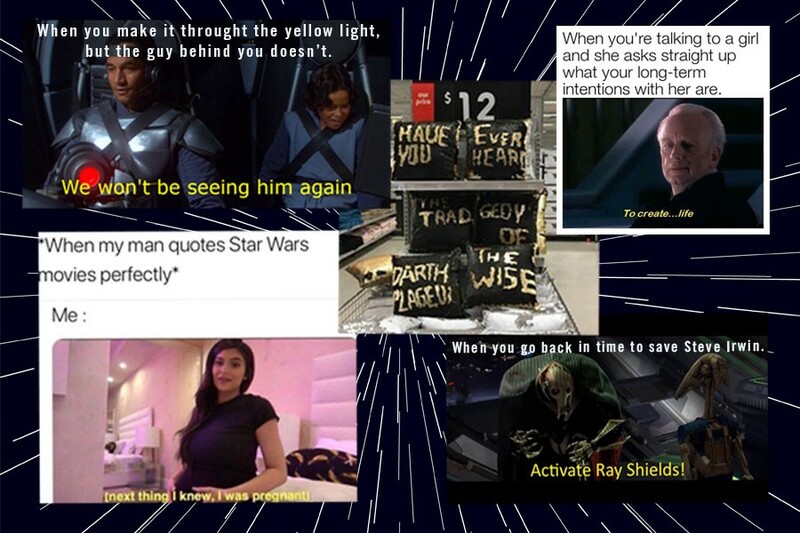 It’s got tough competition, but r/PrequelMemes might be the worst designed message forum on the entire internet. The gold and white font against a black background is ghastly and obliterates your visual cortex. And the header image is a collage of characters from Star Wars Episodes I-III (i.e., “the prequels”) making doof-y faces. 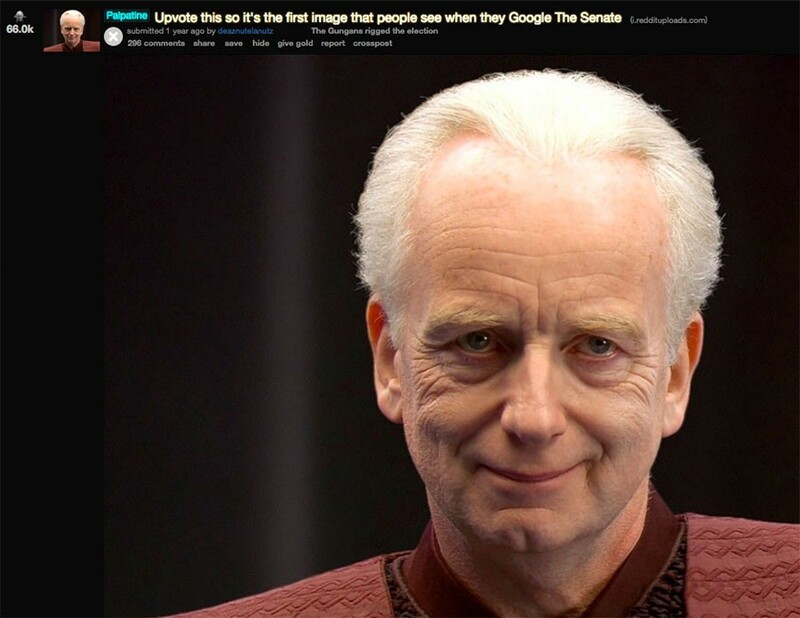 The site turns your computer cursor into an image of Emperor Palpatine, the eventual villain and most iconic character in the prequels. And the right panel of the forum is a photo of the Emperor’s face superimposed onto a shirtless Vladimir Putin. It’s a visually unpleasant experience, much like the films the forum is base on. But to understand r/PrequelMemes, one of the fastest growing memes forums on Reddit the past year, you must first understand the films on which the subreddit is based: Star Wars Episodes I-III, the most disappointing trilogy in film history. Despite being the “original trilogy,” the three Star Wars films George Lucas created between 1977 and 1983, were in fact Episodes IV through VI in the series. And whereas IV-VI were essentially a family-oriented space opera, Episodes I-III were about the war and political infighting that precipitated those events, and far more ambitious from a special effects standpoint. It wasn’t until the late 1990s that digital filmmaking had evolved to the point Lucas felt he could pull off his long-imagined prequel trilogy, and in 1998, he announced he was working on the first of them: Episode I: The Phantom Menace. It quickly became one of the most anticipated films of all time. There were reports of Star Wars superfans attending screenings of Meet Joe Black and The Waterboy just to see a trailer for the upcoming film. Phantom Menace was released the following year and roundly panned by critics despite grossing nearly three times its $115 million production budget. (Roger Ebert loved it, however, giving it 3.5 stars and writing its special effects made for “an astonishing achievement in imaginative filmmaking.”) Episode II: Attack of the Clones and Episode III: Revenge of the Sith are slightly more watchable, but Episodes I, II and III remain the first, second and third worst reviewed movies in the Star Wars franchise (in that order). Collectively, the films are bad — laughably bad when you consider they took decades to make. And it’s that special legacy that r/PrequelMemes celebrates. The films themselves might not be the most enjoyable, but converting their hokier moments into memes is a way to derive ironic joy from them. Or at least that was my operating assumption as a Star Wars fan myself. To know for sure, I left a post on r/PrequelMemes asking its users to explain their love for the subreddit. And true to form, they proceeded to troll me with prequel memes. Although their responses weren’t immediately helpful, they were instructive. 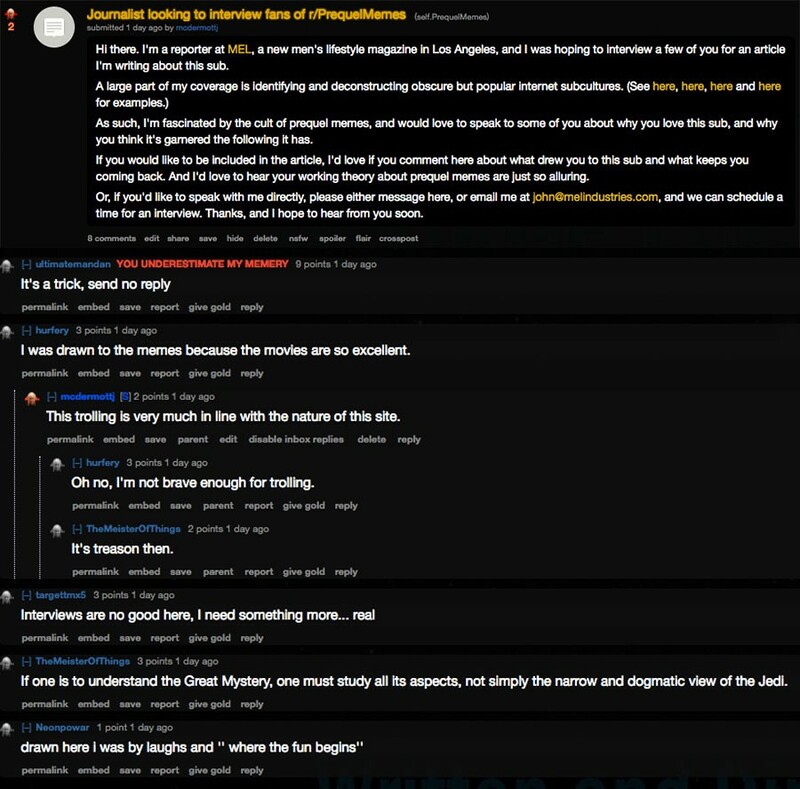 Members of r/PrequelMemes don’t want to deconstruct their adoration for memeing the worst of the Star Wars franchise. The memes are the point, and the point is the memes. 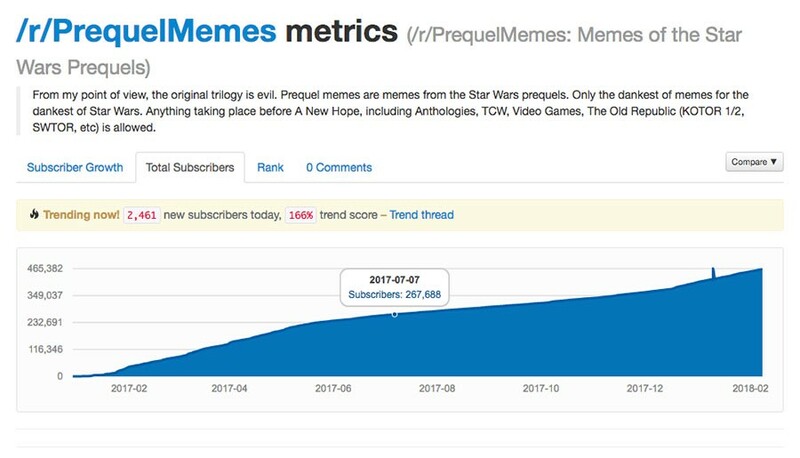 R/PrequelMemes was created on December 30, 2016, according to Reddit Metrics, a site that tracks the popularity of individual subreddits. Just six months later, it had more than a quarter of a million subscribers, adding upwards of 5,000 subscribers on some days. Today, it has more than 460,000 subscribers in all. Politics alone seems like an insufficient explanation for the popularity of r/PrequelMemes, though. If Star Wars geeks wanted to distract themselves from the Trump regime by sharing Jar Jar Binks memes, they could easily do that on r/StarWars, a subreddit for all things Star Wars. I asked the r/PrequelMemes moderators why they thought the subreddit has garnered such a large following, but they were equally resistant to serious introspection. Only one of the moderators (username Adventurous Swine), agreed to speak with me, and his explanations for the subreddit’s popularity were circular. Adventurous Swine’s friend started the subreddit because he enjoyed the films growing up and thought it would be fun to start a meme community around them. And Adventurous Swine decided to help because he liked the films, too, as a kid. This, of course, isn’t much of an explanation at all; it’s a tautology. But the more I pushed Adventurous Swine to think critically about the subreddit and consider its underlying motivations, the more he bristled: “Sometimes people overanalyze things and forget to just relax and enjoy something for the purpose of enjoying it. Star Wars is like that. 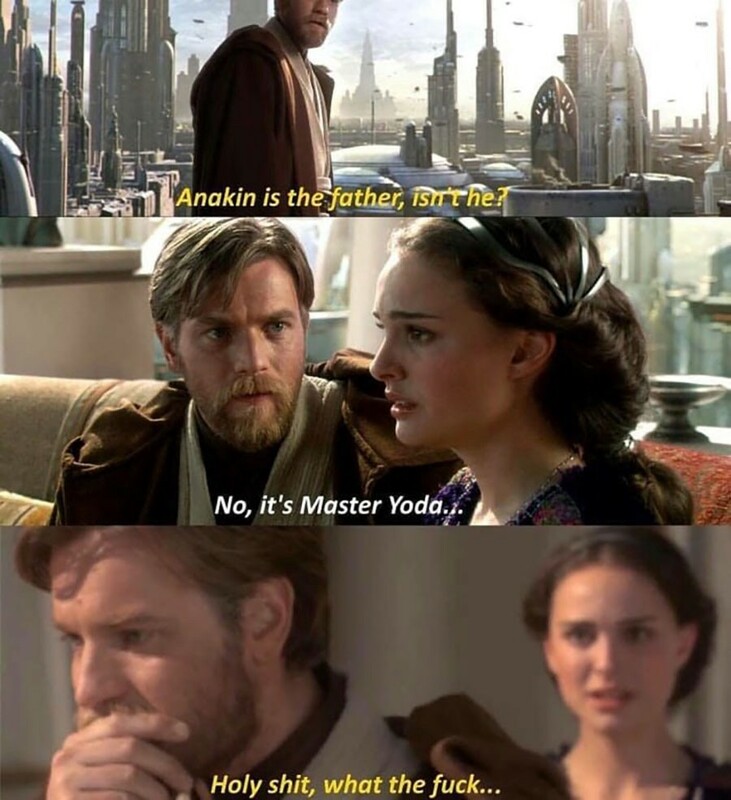 The prequels specifically offer a sort of backstory that fills in gaps that were otherwise not filled in when the original films came out. There is a point in the lifespan of every meme where the meme becomes so ubiquitous that it achieves a kind of escape velocity and begins feeding off its own popularity. The act of replicating the meme is suddenly more funny than the meme itself. That, more than anything else, seems to be the point of r/PrequelMemes. You don’t create and re-post prequel memes to make a commentary on George Lucas’ hubris or Hayden Christensen’s wooden acting. You do it just to do it. 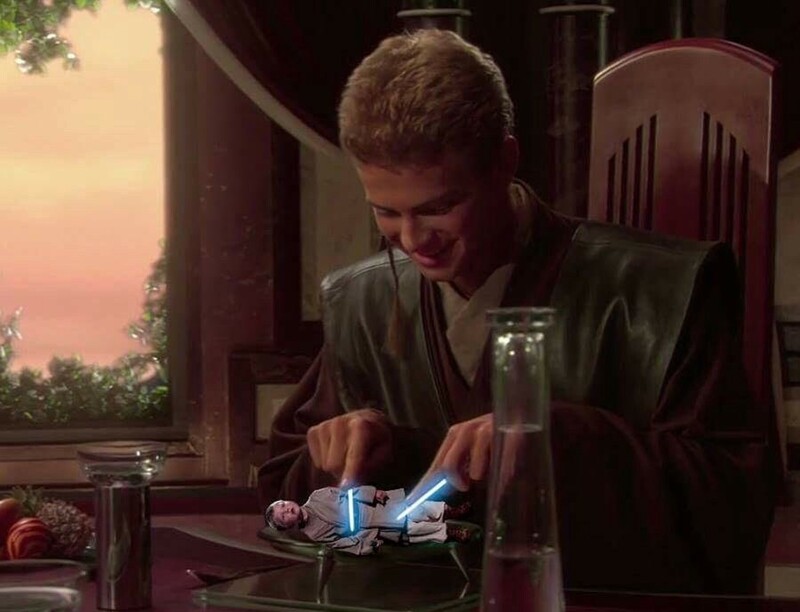 Like a young Luke Skywalker training to be a Jedi, my attempts to intellectualize r/PrequelMemes actually prevented me from truly understanding it. 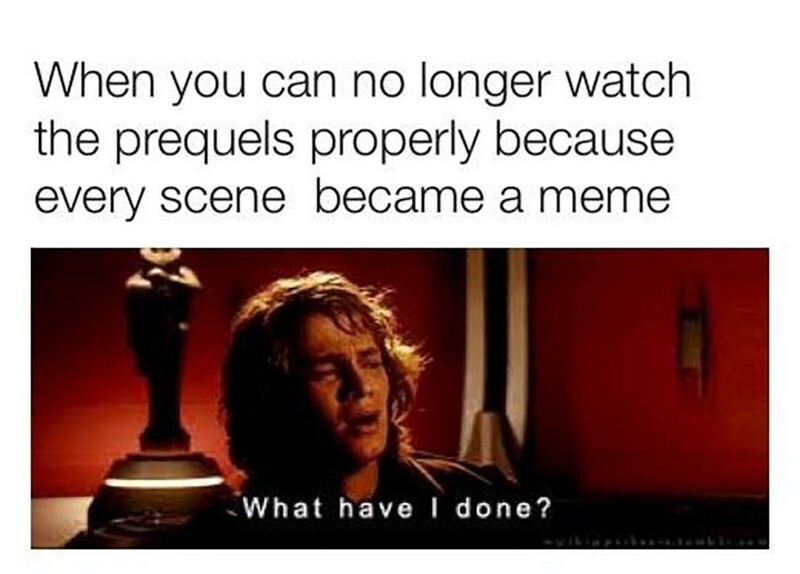 There is no why when it comes to prequel memes. There is simply do, or do not. Then again, those references come directly from the original trilogy.